NGC 346 is in the upper right (northwest) portion of the image above. It is a bright star forming region in our neighboring dwarf galaxy, the Small Magellanic Cloud, in the southern constellation of Tucana. It represents an open star cluster that irradiates the surrounding gas, causing it to glow in brilliant red and blue/green colors. The resulting emission nebula is known as N66 which spans nearly 200 light years at a distance of about 210,000 light years. The stars comprising NGC 346 are young – only a few million years old. 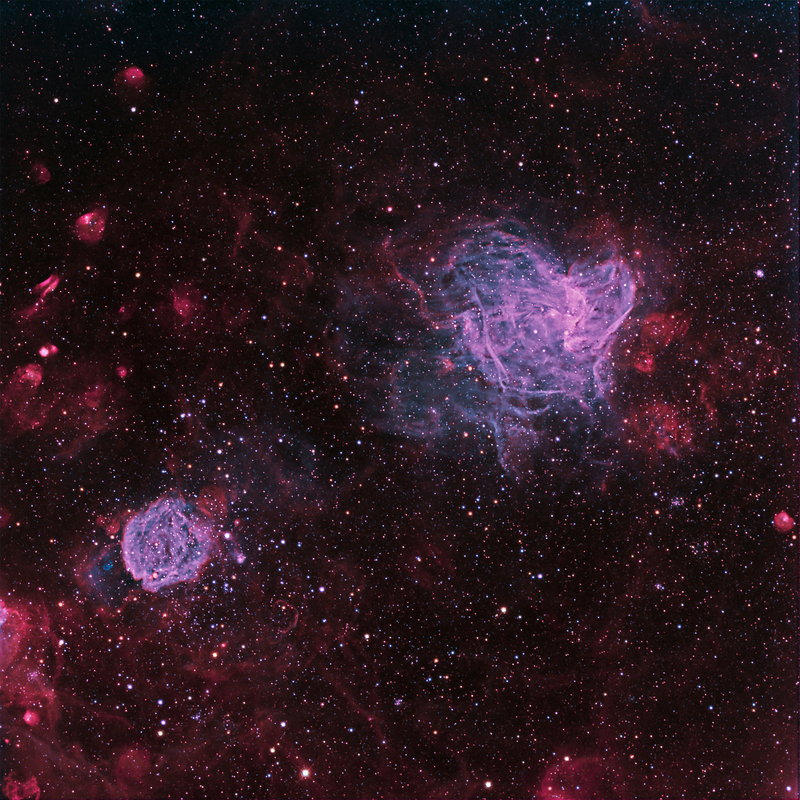 X-Ray data suggest that this region is filled with the remnants of an ancient supernova explosion thousands of years ago. The other bright object in the lower left area of the image in NGC 371. Similarly, it also represents an open cluster of young stars surrounded by an emission nebula. 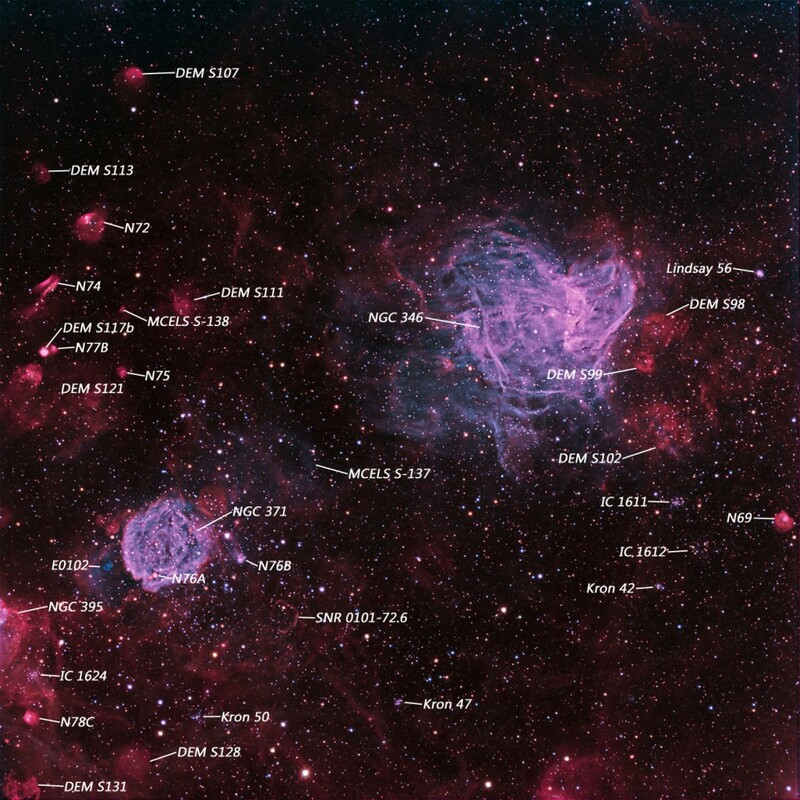 The image is 33� x 33� with North toward the upper left and East lower left. NGC 346 is ~ 14� and NGC 371 is ~8�. The image represents nearly 12 hours of exposure. The nebula color and detail result from high contrast 3 nm oxygen (OIII) and hydrogen-alpha (H-a) narrowband filters. OIII was color mapped to blue and green and H-a to red/magenta to achieve �natural� colors. Stars colors were added from short RGB exposures. Please find below an annotated version of the above image, courtesy of Sakib Rasool.